JUST ADD WATER! - The Americans .US! 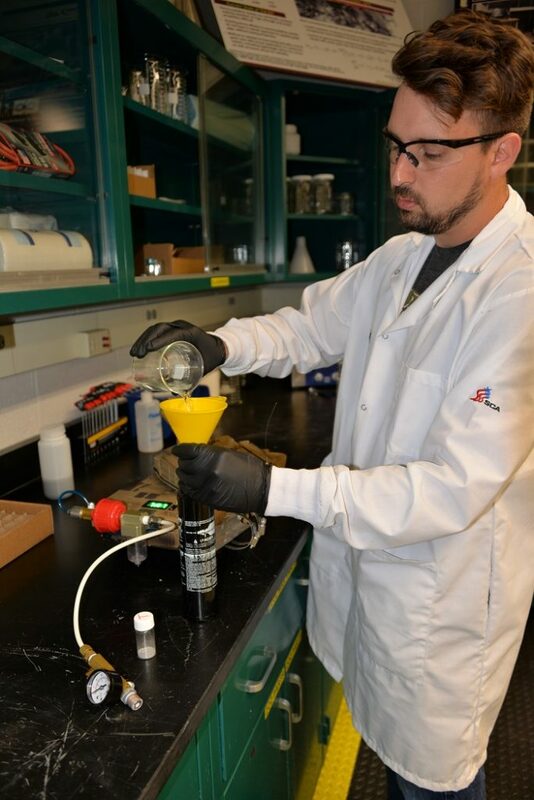 The Army Research Laboratory’s new nanomaterial paves the way for efficient and green energy solutions. Like many great scientific advancements, the U.S. Army Research Laboratory’s (ARL) new nanomaterial was invented by accident. Materials engineers at ARL on Aberdeen Proving Ground, Maryland, were trying to engineer a nanostructured aluminum alloy in January 2017 when, during polishing and hardness testing, they discovered the aluminum powder was disappearing—it was reacting with the water used in the polishing process to create hydrogen. While the discovery surprised ARL scientists, they knew they had come across something quite extraordinary. “This is the main thing: It can generate power on demand in the field, wherever we need it,” Dr. Anit Giri, materials engineer with the Materials and Manufacturing Science Division at ARL, said of the powder. 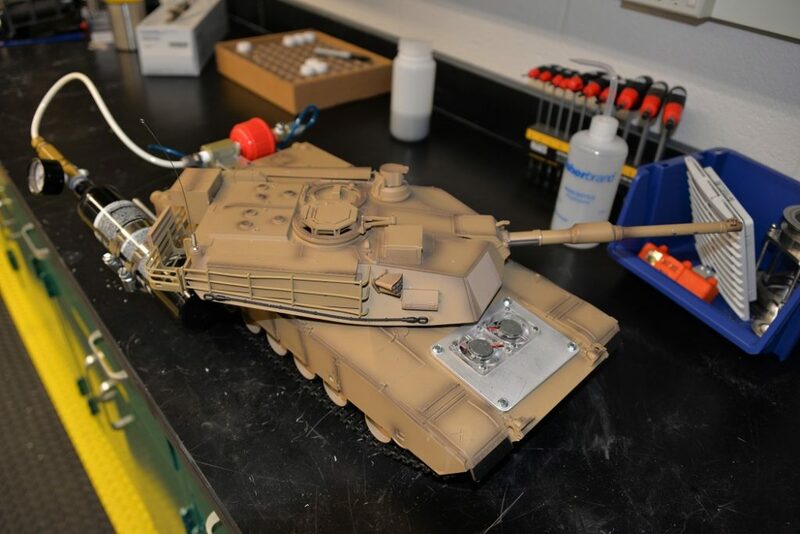 A remote-controlled tank at ARL, powered by hydrogen-electric fuel, awaits demonstration. Fuel systems like this one eliminate the need for high-pressure hydrogen canisters that can pose an extreme hazard on the battlefield if ruptured. The nanogalvanic aluminum-based powder came about as scientists were researching better, stronger materials for armoring Soldiers and vehicles—specifically, an aluminum with the strength of steel. This effort to make better materials for armor is ongoing, despite the excitement of new discoveries like the powder. Dr. Chad Hornbuckle, materials engineer on the powder’s development team, explained that the original intent was to create a nanostructured aluminum alloy that would have increased strength, making a material that was lightweight like aluminum but comparable in strength to steel. A material on the nanoscale is less than 100 nanometers long, Hornbuckle said. (A nanometer is one-millionth of a millimeter; a millimeter is very small, but is visible to the naked eye.) The nanoscale is often used to measure dimensions of matter on an atomic level. The aluminum material they were trying to create began as a powder, and during the usual analysis process, it had to undergo hardness testing, said Anthony Roberts, also a materials engineer on the development team. The team pressed the powder into a compact, a solid piece, to polish to a mirror shine for the hardness test. “Well, while we were polishing it, we noticed it disappeared, so we made another compact, and we start polishing it, and we noticed it started disappearing real quick,” Roberts said. “A part of the polishing process is sandpaper and water, and we noticed that the water was reacting with it and it was disappearing. We found out it was creating hydrogen,” he said. The hydrogen was created during a hydrolysis reaction: aluminum reacting with water to produce aluminum hydroxide, or aluminum oxide, plus hydrogen, Giri said. This reaction occurs with all aluminum, and normally the formation of an aluminum oxide layer inhibits the creation of hydrogen. However, in the case of the nanogalvanic aluminum-based powder, the reaction was disrupted—the aluminum oxide layer did not form. Nanogalvanic aluminum powder’s scientific definition is a powder that consists of galvanic cells in nanoscale with aluminum as the anode, coupled with another element acting as the cathode; galvanic corrosion occurs when two dissimilar metals make contact with one another in the presence of an electrolyte—any liquid that contains water—thereby forming a galvanic couple, the development team said. That means the powder is an electrochemical substance where the coupling of a positively charged electrode from the aluminum (anode) and a negatively charged electrode from another element (cathode) in water produces electricity. “The powder has some aluminum with some extra additional elements, so what happens is, when the water comes in contact with the powder, some of these additional elements want to basically pull electrons from the water. So it essentially caused the water to break down,” Hornbuckle said. The water reacted with the extra elements in the powder and separated the hydrogen and oxygen. Because the reaction took place on the nanoscale, the powder could not form an encapsulating oxide layer and it continued to react with water, creating hydrogen. The hydrolysis reaction in the powder occurs at room temperature without any catalysts, chemicals or external power, making the powder a good source of on-demand hydrogen fuel. Robert Dowding, materials engineer and chief of the Lightweight and Specialty Metals branch, said that, to his knowledge, ARL is the only laboratory working on developing the nanogalvanic aluminum-based powder. “We’re doing a systematic investigation of these materials. We’re interested in what compositional range is going to work for us, what sort of microstructures are going to be important, how things are arranged—and then the process becomes important,” he said. ARL is using a milling process to make the powder, which tends to be expensive, Dowding said. The lab is looking at other methods to make the powder that would be less expensive and more commonly available. Part of that process includes partnering with industry to find better, less expensive methods of production and distribution. At the time of these interviews, ARL has filed a patent application for the powder; once the patent has been issued, ARL will be able to license it to industry to aid its development. “We are mandated by Congress per our mission lines to do R&D [research and development]—it is not our job [to], nor has Congress told us we should, be in the business of competing with industry for commercial markets,” said Joshua Houck, a representative from ARL’s Technology Transfer and Outreach Office. “What we’ve found is the best way, one of the least expensive ways, the Army can procure a capability, is by developing a technology that hopefully has what we call dual use.” A dual-use technology, one that has both military and commercial applications, enables ARL to license the technology to industry for mass production and then buy it back at a less expensive rate from a competitive market. When the government licenses its intellectual property—such as the nanogalvanic powder—to industry for production, the overall unit cost of the item drops considerably, and the Army is able to buy it back at a much lower cost than if it had kept the technology and made it at one manufacturer, he said. Within the Army itself, creating a consumer-ready product is done through, for example, the U.S. Army Armament Research, Development and Engineering Center, product managers and program executive offices, Houck said. But if a product is produced commercially, then the Army can buy it back and tailor it to military requirements. Anthony Roberts, materials engineer, prepares a fuel canister for a remote-controlled tank demonstration. Nanogalvanic aluminum-based powder goes into the canister first, followed by water or any water-based liquid—liquids like coffee, sports drinks or even urine. The powder is an exciting breakthrough for ARL and the Army, particularly for the logistics involved in energy distribution. “One of the major issues now with the distribution of energy is usually JP-8 in large bladders,” Houck said. JP-8, or Jet Propellant 8, is the fuel used in most military systems now. These bladders of JP-8 contain a large liquid volume and are somewhat fragile. “It is very difficult to airdrop liquids in these large bladders. They have a tendency to burst when they hit the ground,” Houck said. “If you shoot them, they get a hole in them and stuff sprays out,” he continued. “So one of the advantages of this powder is it being a solid, whether it’s in powder form or compressed tablet form.” If shot, it will just break, maintaining all of its properties even in pieces. It won’t catch fire, it won’t explode—unlike what the high-pressure hydrogen fuel cylinders used today might do if they rupture. 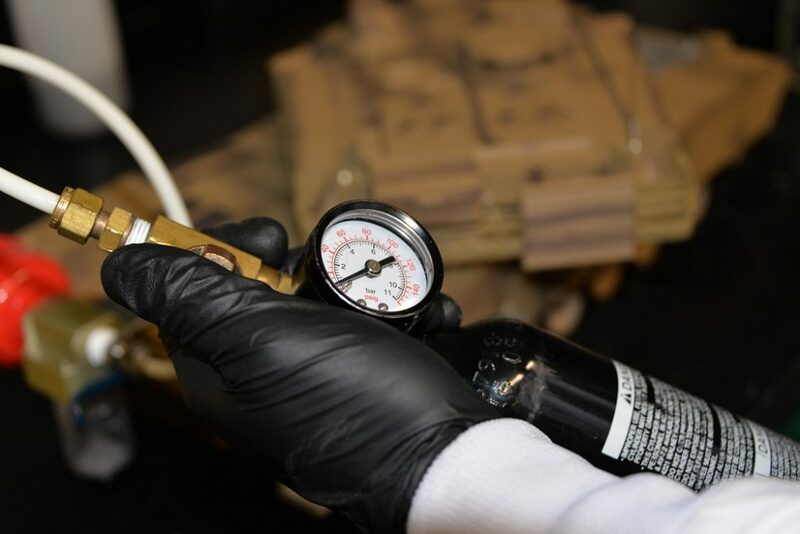 The powder gives the Army the ability to store “energy capacity, the ability to generate energy in a safe and nonvolatile form for transport,” he said. The powder, which can be manufactured in any quantity, can be scaled down in volume enough that Soldiers could carry their own supply. “I can just have however much of it I want, again, either in powder or this Alka-Seltzer-type tablet form, and then pull it out and drop it to generate hydrogen where I need it,” Houck said. To begin the reaction, the powder—loose or compressed—is mixed with water in a canister. The hydrogen that is created then feeds into a fuel cell, where it can generate electricity for vehicles, computer systems or anything that needs power. One kilogram of the powder can generate 4.4 kilowatt-hours of energy—enough to power 10, 60-watt incandescent lightbulbs for more than seven hours or the equivalent LED bulbs for over 50 hours, Giri said. And the only emission from the reaction is water—pure water, Roberts said. If the reaction is created using a fixed amount of water, a Soldier could get back about 50 percent of the original water, with diminishing water returns, Giri said. Once the water source runs out, the Soldier would be out of power. Given an unlimited supply of water and powder, the reaction could continuously produce hydrogen for fuel. The source of water doesn’t have to be pure water, either—it can be any water-based liquid, like coffee, soda, wastewater, spit or even urine. The emissions from the reaction would not change, even if the water-based liquid were varied. “That’s the great thing. You could use urine to create this energy, right? And then what comes out on the other side is pure water. So then you could have drinking water again,” Roberts said. A new hydrogen fuel source, nanogalvanic aluminum-based powder, opens up many new possibilities, from standard fuel cells and internal combustion engines to on-demand battery power for personal devices, all the way up to a future that could include self-cannibalizing drones. While such a drone is just a pie-in-the-sky idea at the moment, the logistical implications are intriguing. The conceptual drone’s structure would be made of bimetallic tubes, Dowding said. Inside the tube would be a layer of the nanogalvanic aluminum composition, while the outside would be made of conventional aluminum alloy. Water would flow through the actual structure of the drone, reacting with the layer of nanogalvanic aluminum to create hydrogen that would act as a secondary or emergency fuel source. Parts of the drone would, in effect, become sacrificial. “The idea is that you can have it eat away part of itself that is not very important to keep going and create energy from that,” Roberts said. This would eliminate the need for a cumbersome fuel tank or power source, potentially making the drone smaller and more maneuverable. Regardless of how it is applied—in the military or commercially—ARL scientists are confident in the powder’s potential. “Wherever you need power, you can use it,” Giri said. JACQUELINE M. HAMES is a writer and editor with Army AL&T magazine. She holds a B.A. in creative writing from Christopher Newport University. She has more than 10 years of experience writing and editing for the military, with seven of those years spent producing news and feature articles for publication. GAME CHANGERArmy Selects Four Acquisition Project Directors for Fiscal Years 2019 and 2020!